Nice opening. Klady still has Avengers a million behind Force Awakens. Mojo is pushing a flat $250 million. All of this is marketing now. The worldwide number is more impressive, up $90 million from the previous leader, with China kicking in the next couple weekends. What can I tell people who don’t want to hear? There will be six $100 million openings before July. The record for a full year is eight. And then, there will be a massive wave of “middle class” openings between $50-$80 million with Ant-Man and the Wasp, Skyscraper, Mamma Mia! Here We Go Again, Mission: Impossible: Fallout, and two possible cartoon openings getting to $50m+ with Hotel Transylvania 3 and Teen Titans Go To The Movies. But that doesn’t include al the programmers than will open between $20-$50 million: Life of The Party, Book Club, Action Point, Ocean’s 8 (which could blow up even larger), The First Purge, Equalizer 2, The Meg and Crazy Rich Asians. 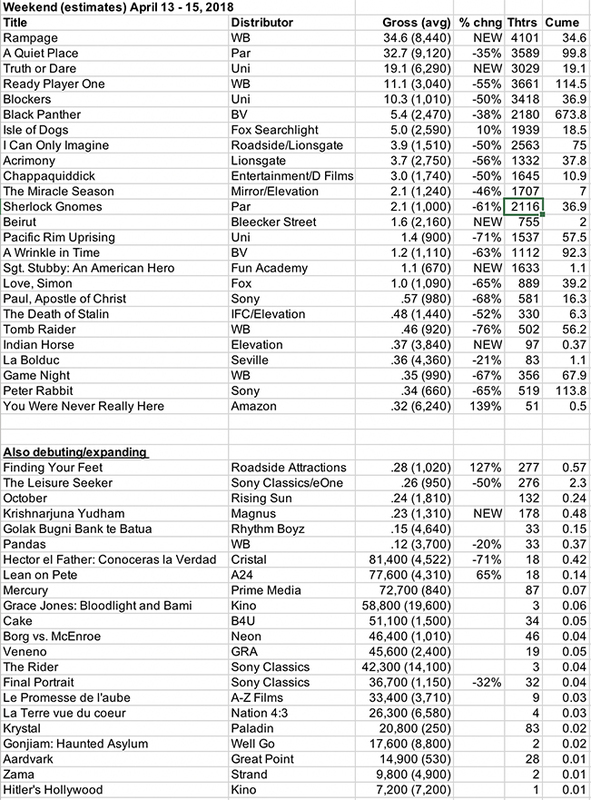 That’s 19 solid-to-sensational openings in three months, playing to all fields… but wah wah wah, no one wants to go to the movie theater anymore. Someone forgot to tell movie lovers. And this is just the domestic box office. There is a momentary downside to this. No film without an Avenger on more than 40 screens did more than $5,000 per screen for the weekend. And only three did more than $3,000 with any screen count. Nice number for Disobedience on 5five managing $47K per. Those are well-attended screenings. Will be interesting to learn how many Orthodox Jews attended. A Quiet Place, the opposite of Infinity War, crosses $150 million on Tuesday or Wednesday. It will be Paramount’s first $150 million domestic movie in the last 21 months, the first $150 million original in 29 months, and one of only eight $150m domestic grossers for the studio in the last five years (five of those being franchise sequels). And Black Panther dropped only 10%, as Disney tries (likely in vain) to get the film to $700m domestic and to pass Star Wars: The Last Jedi on worldwide gross (that happens this coming week). 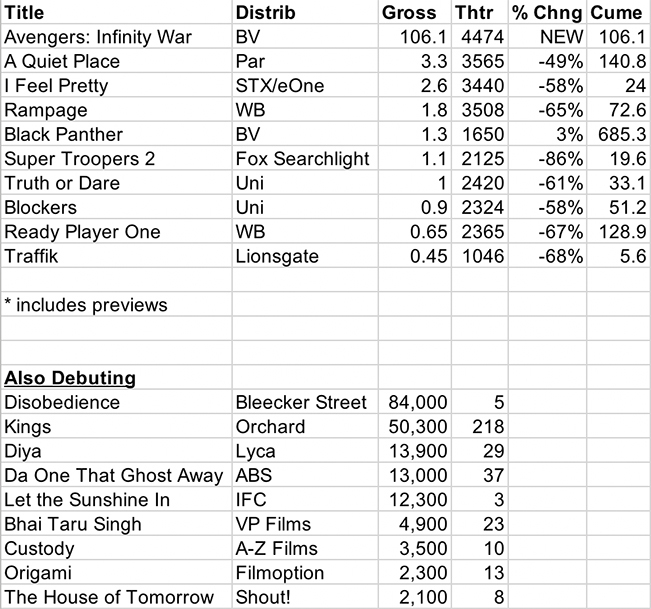 A Quiet Place didn’t officially lose screens… but they lost theaters, as Avengers ate most of the multiples at ‘plexes. 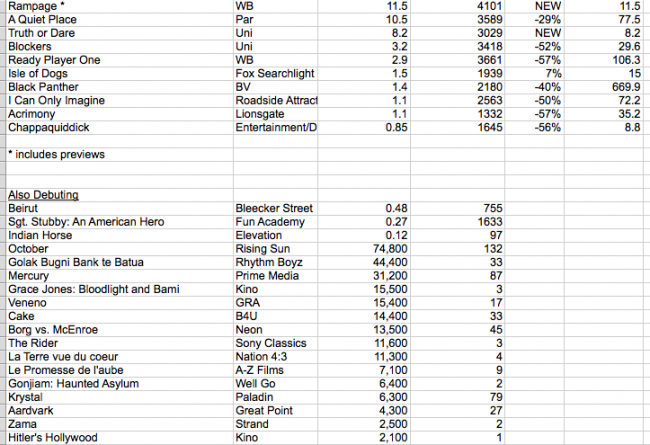 The Avengers claim of 4474 theaters likely means 15,000 actual screens this opening weekend, if not more. This means fewer options for seeing other movies like A Quiet Place. 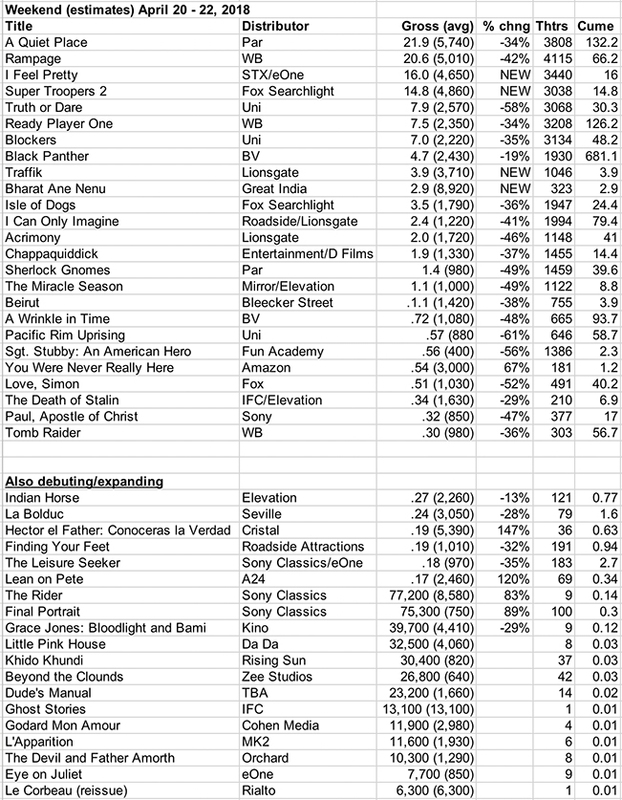 A 49% Friday drop for the film is actually good news. And it will improve over the weekend. Black Panther, losing theaters, got a bump out of the Avengers arrival. Impressive. Everyone else lost more than 50% of last week’s number. Welcome to the summer. In limited release, Disobedience worked as counterprogramming. Orthodox Judaism, hot chicks (who are also two of our best actresses), and self-empowerment deliver over $40k per screen for the weekend. The Academy release on the doc rules changes is not clear, but it appears that the Branch has widened the field for streamers. I stupidly glossed over the mailing house piece of today’s Academy announcement because I thought it was what we knew was coming. But taking control of screening invites and the like is another thing altogether. And could end up being an overreach that costs Dawn Hudson her job. My issue with The Academy taking control of all invites is not so much the overreach but the simple issue of competence. The Academy is not set up to be doing the job that 25-35 people currently do. Are they going to hire a booking crew? It’s a weird choice to put businesses (like Peggy Seigel’s) in jeopardy and to make the process more complicated for both members and studios. Also, the bias against Phase 2 screenings is idiotic. Everything should lean more to the more narrowly defined Phase 2. If I were king, I would severely limit the Phase One dog & pony show and make it much more on the movies, then let personalities run free in Phase 2. Idiotic. 2m subs, 90% of whom know this was too good to last. Exhibitors and Studios should see a subscription service as a way of finding a broader audience, not serving the frequent ticket buyer core… which is what MoviePass has done. $10 a month is not an option… unless it is Mon-Thurs only (which is what I would suggest). No. It’s “don’t save it” because it is a bankruptcy trap. A Quiet Place continues to overperform even itself, Super Troopers 2 couldn’t double its Friday haul (although it’s still $4 million from the total of the original, so why would anyone complain? ), I Feel Pretty failed to do 3x opening (ugly), and IFC’s Ghost Stories is the only $10,000 per screen of the weekend, albeit on only one screen. A Quiet Place continues to be the date movie of the year, getting a 45% Saturday bump in its third weekend in theaters. That’s not a Black Panther pattern, but it’s pretty great. The movie is well ahead of Split and Get Out, the thrillers of early last year, after three weekends. 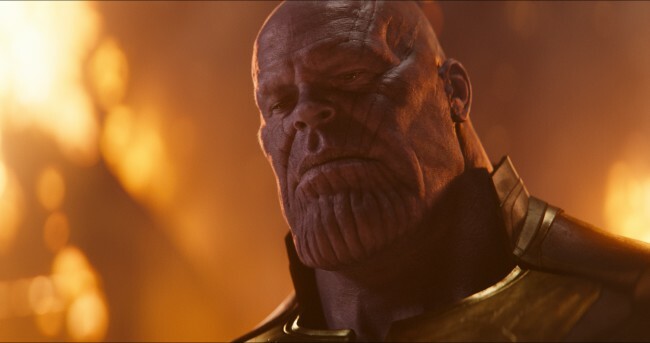 The biggest question now is the dating, which may feel like it wasn’t given room before the summer movies launch, made worse by Avengers 3 coming out a week before the normal summer start. Paramount may get lucky and find that AQP plays to the audience that waits a few weeks to act on word-of-mouth and are also not interested in comic-book movies. The only head-to-head competition through May is Breaking In, for which Universal has not put on the full court press. So maybe $200 million domestic is possible. As much as the hit movie calendar has expanded in the last couple of years, finding the right date is still critical. And you have to wonder, why is the Johnny Knoxville movie so early in the summer (October is his money slot and wouldn’t his schtick play better in summer after the mega-movies?) and why is a Tyler Perry movie pushed into November for the first time in his career? I Feel Pretty was in trouble when it launched on Friday and it managed to get worse. Many female critics rejected it and men weren’t in a rush from the start. Whatever the flaws of the film, making the campaign all Schumer all the time was a big mistake. There is plenty of material to work with that was dropped in favor of Schumer hitting her head and acting goofy. You can’t sell it as a movie about finding your strength when the ads are telling us that the lead is delusional about being powerful. Super Troopers 2 did great… just not as great as the opening day suggested could be possible. Still, the original did $18.5 million. The sequel is already at $14.8m. Even if it gets to just $25 million domestic, Searchlight spent carefully and only put it on 2,038 screens and will make money with this title. Hard to say what Lionsgate was chasing with Traffik. Maybe I just never saw anything because I’m in the wrong market. But it was soft. Another weekend, another question about the effectiveness of tracking for estimating opening weekends. Tracking is not designed to be an accurate reflector of the weekend box office to come, I will say for the millionth time.. 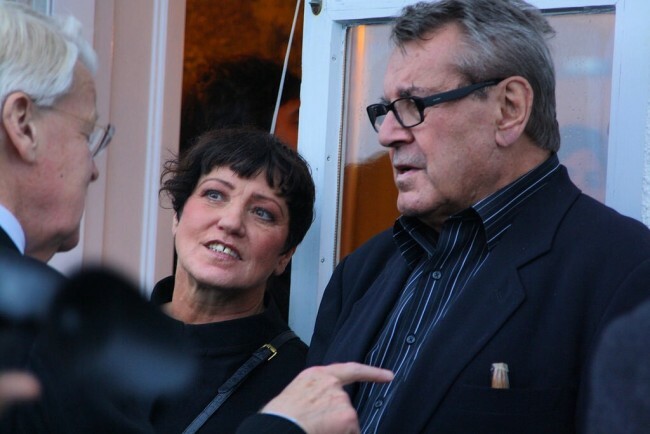 When it is used that way, either by the trackers and the distributors, it is abuse, not the intended purpose. You can learn from looking at the numbers that come to pass and the tracking numbers that came before them. But as a tool to estimate opening weekends, there are more circumstances in which tracking cannot be counted on for that specific thing than there are those in which the numbers align. I was about to write, “This weekend,” when the fact is that we still know only the Friday numbers. This is what I am talking about: terrible, lazy habits of stating guesses as fact. 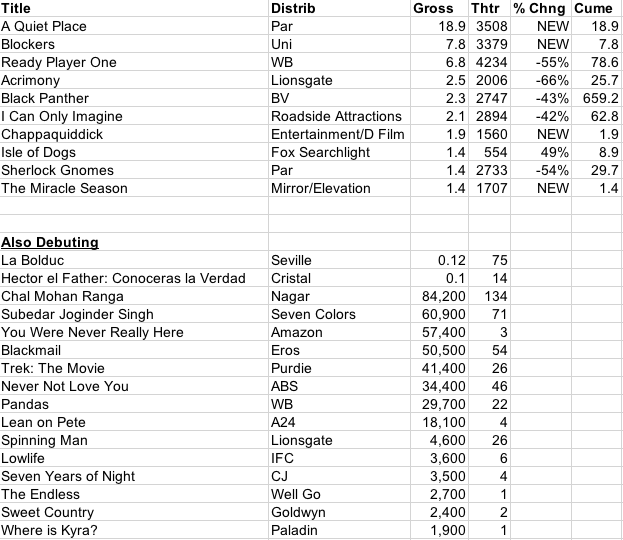 With two new films in the Top 3, here is what we know about the weekend number on those three films after Friday. A Quiet Place should end up between $16.8-$17.5 million. This is after two weekends of information: we know it bumps on Saturday (couples are going) and drops consistently on Sunday. Super Troopers 2 is a happy surprise. Sixteen years ago, Searchlight was wide-eyed about the original and it looked like a franchise launch. 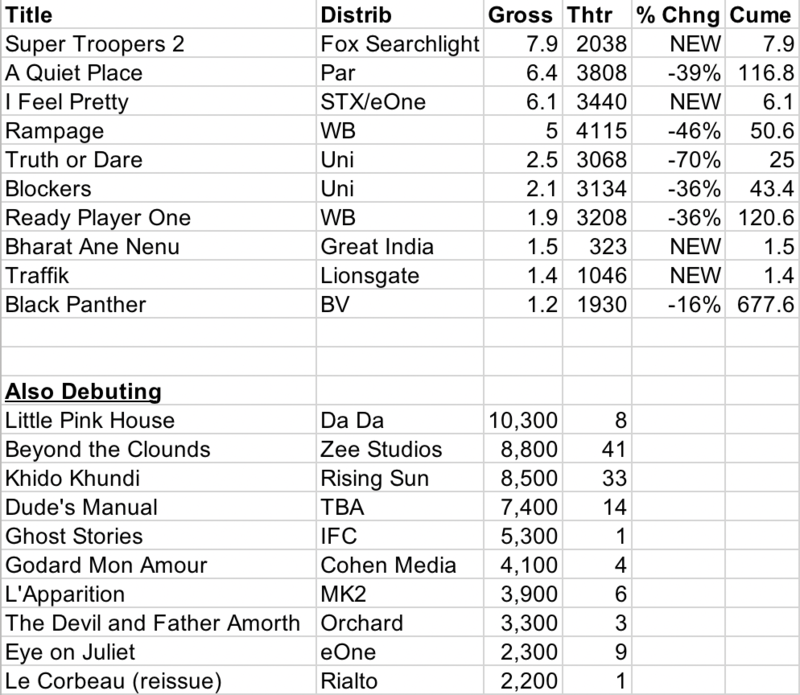 But although it was profitable, the gross was not spectacular and small issues got in the way of a sequel. Instead we got Club Dread, which flopped and deeply wounded the Broken Lizard brand. Then Jay Chandrasekhar was taken on by Warner Bros and a Dukes of Hazzard and a Beerfest later, he was a television director and Broken Lizard was comatose. But in the spirit of Blumhouse, Broken Lizard crowdfunded a chunk of a low budget and got back together with Searchlight. They have a low-end success, but a true one. Even if the bottom drops out – and everyone is only guessing whether it might – a $15 million opening is a surprise and a win, even more so with a smartly cautious 2038 theater count. And what if (gulp!) it catches on and finds a bigger audience than the BL Cult? There is another lesson. If Searchlight didn’t own and then exercise their rights to this sequel, it would have wound up on Netflix. You can bet Netflix spent last night trying to find out what the Broken Lizard commitments are going forward. They would be a cheap and proper complement to their Sandler franchise. And you can bet that Disney wants them on their OTT in a couple of years. But instead, with very low risk, Searchlight adds more than $10 million to the profit column of their spreadsheet, which is not nothing. As for I Feel Pretty… STX got sucked into the Amy Schumer-is-not-really-a-movie star trendline and didn’t fight to overcome it. Of the dozens I have told about Michelle Williams’ brilliant performance in the film, one even knew she was in the movie. Looking at the trailer again (Williams has two quick shots and a “wow”), I was struck by how the pitch, like the film, missed the opportunity completely. The film makes fun of Schumer until she has some level of comeback at the end. But their idea of the movie was a universality of how women who are anything less than model perfect are overly self-critical… and how even those who are model-perfect do the same. Even in the trailer, other women mock Schumer for feeling good about herself. This movie has the same problems that I anticipated when I saw that Schumer had become connected to the wannabe Barbie movie franchise. Rampage is, as expected, all about the international. But even as it passes $200m worldwide this weekend, there is a danger of red ink. Ready Player One, which has 200 of its $500 million coming from China is only just into the black (depending on what Spielberg is getting and from what pot). A reminder: Chinese dollars are worth half of what other theatrical dollars are worth to the distributor. So the true China adjusted gross for Ready Player One is about $400 million worldwide. And even with some big markets to open, Rampage is “really” at $175 million. The arthouse opener of the weekend is IFC’s Ghost Stories, with over $10,000 in a single haunting. The Academy can survive & thrive. It is not as broken as it has been made out to be. But it needed change. It needed inclusion. Absolutely. Dawn Hudson manages up well, but she has damaged The Academy because she still doesn’t understand what the organization is. Change for The Academy should be built, first and last, on transparency. But it has been more about managing fear in the last few years than it has about doing what it says it aspires to… making the world of cinema better for women, POC, and all generations to come. I don’t want to sound hokey. The Academy was always a business and built on self-congratulation. But it became greater than its intent. More meaningful. And The Academy does do some great things. But it should be doing so much more. It has the weight to support real change. Too much of what Dawn Hudson has done is to manage the money. And that tail of cash wags the dog. Giving Netflix Oscars is not progress. Finding a way to celebrate a wider berth of film, worldwide, all year long… not in a museum without a vision… that would be progress. HFPA is completely illegitimate, bordering on criminal, and yet, many prefer the Globes because at least they have some damned fun!!! Meanwhile, Oscar is so afraid of falling back, it does nothing but change the deck chairs each year… and continues to fall back. The ends do not justify the means when you mean to take the moral high ground. The Academy has done some really good things. But by making it a publicity exercise instead of a transparent, moral, industry-examining scream, it throws away the power. I have said this many, many times. Opening The Academy to inclusion is great. Lying about the process and results destroys the good intentions. Unlike Bill, I think The Academy should be in the fight. But it needs to be a wise adult, not a desperate follower. In all directions, I am sick of hearing about how things are quietly being taken care of in the corridors of power. That is, in the end, never the answer. Bless those who have stepped up. But while I don’t expect a revolution, I know this is a bloody fight. And what are we doing 7 months after Weinstein exploded? Celebrating what happened 7 months ago. Who is the last big name to get slapped hard? Does anyone thing even 25% of offenders have been called out publicly? How many are quietly plotting their return? If people choose to just leave it as it has been, so be it. Not my preference, but I have no real power. But if so, let’s be honest about it. A Quiet Place was not #1 this weekend, but even if it had been #1, it’s irrelevant. It is easily the bigger box office story of the weekend. 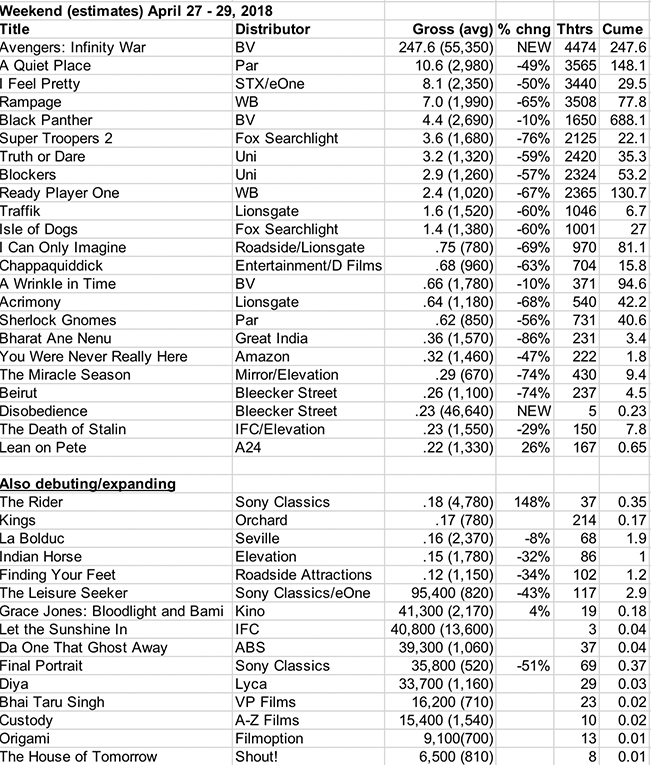 A 35% drop in a second weekend that, 1) comes after a $30m+ opening weekend, 2) is not influenced by a holiday weekend, and 3) is not an animated film is extremely rare. A Quiet Place is #1500 on the big chart of great holds at Box Office Mojo. But there are only 84 movies ever that opened over $30 million and held 65% of the number the next weekend. Twenty-seven of those are animated films, which are stronger holders than any other genre. Twenty-three had second weekend on Christmas, New Year’s or Thanksgiving. That brings us down to 37 titles. Fifteen more are summer releases. 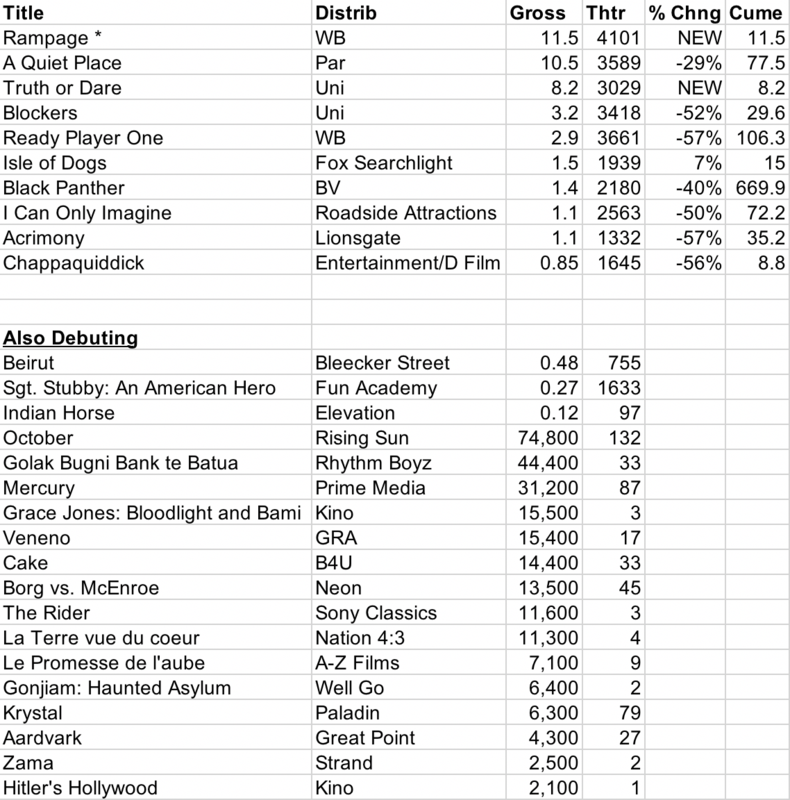 Of the 19 films still on the list, only seven had openings over $40 million and only four launching with over $50 million. They are American Sniper, Gravity, The Martian and now, A Quiet Place. You may argue that I am being too generous to this film’s numbers, but every standard I have used has been pretty broad and reasonable. Holding better over a holiday weekend is to be expected. Animated films have a unique place. And the bigger the opening, the more challenging a 35% hold becomes. There are amazing holds like Star Wars VII, Jurassic World, Black Panther and the nine other films with $100 million openings that held 50% or better the second weekend. But it is easy to undervalue the performance of A Quiet Place too. When I guessed that it would be a $150 million movie, others thought I was being too ambitious… turns out I was being too conservative. It is $20 million+ ahead of last year’s biggest thrillers, Get Out and Split, after two weekends, suggesting that $200 million domestic is a legit possibility. Now… Rampage. Meh. But take away the films in which Dwayne was not a lead (aka, not on the one-sheet) and was not animated and is not a sequel and this is his third best opening. Now, adjust with Jumanji: Welcome To The Jungle and GI Joe: Retaliation, which were both really reboots based heavily on The Rock’s star power… so Top 5. But, Top 5. Yes, WB was aiming at San Andreas, not Central Intelligence. But anyone foolish enough to expect F&F numbers deserves to be beaten about the head and shoulders. And of course, the film is already right at $150 million worldwide in its first weekend… which is why Dwayne is one of the few worth the money these days. Truth or Dare is another Blumhouse win, albeit a small one. Cost nothing. Universal spent a ton on outdoor and modestly on very targeted TV and an aggressive online campaign. Smelled of direct-to-Netflix. But much better than that, financially. Fox Searchlight is managing Isle of Dogs carefully, but successfully. 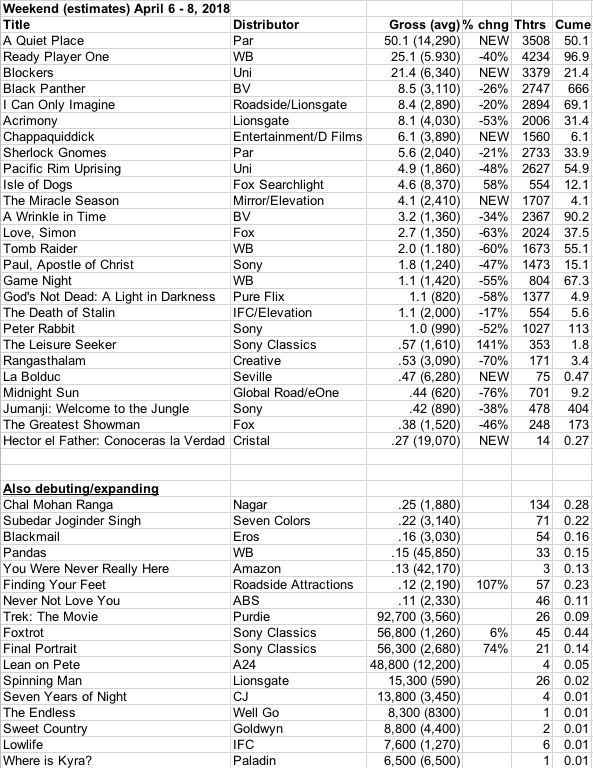 The expansion from 554 to 1939 screens was more abrupt than Grand Budapest, but less so than Fantastic Mr. Fox, which went from four to 2,033. Dogs should land right between the two previous Searchlight forays with Wes domestically. There is no sign that the strained complaints about cultural appropriation have taken a toll (aside from the ads losing their Asian flair). Blockers will be (unfairly) used as a cautionary tale over lunches for the next month. It’s done fine. But it hasn’t gotten a second wind. It could easily do 3x opening. But it has not become America’s obsession… especially with young women, where it was expected to explode by many. One wonders whether A Quiet Place, albeit in a very different genre, took its wind. Amazingly, Sony Animation has its sixth $100 million domestic grosser with Peter Rabbit. Done now, but $300 million worldwide is nothing to hop at. Expect a sequel. Kino has a hit with Grace Jones: Bloodlight and Bami. Maybe it could have been bigger. I am surprised that I was never invited to see the film before release (or get a link). I am a slave to the rhythm and it would have been high on my watch list. 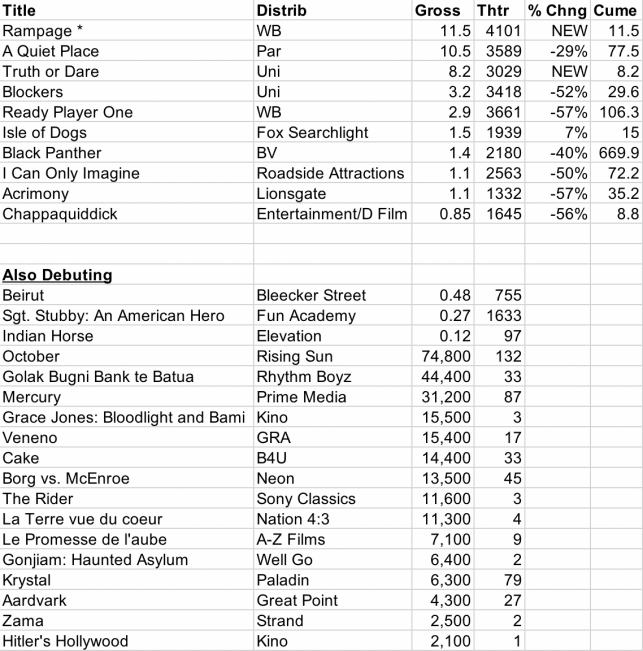 And Sony Classics has another quiet cashflow film with The Leisure Seeker, very low profile, but also very low-priced for the domestic release and already over $2.3 million. A Quiet Place is one of those stories where good things happen and no one can take credit for “tricking” the audience into showing up. Tracking had the film’s opening 3-day at about what it madae on Friday (with the now-presumed and incorporated Thursday night). My guess is women. A Quiet Place is about a family trying to survive with the females and male of equal – but different – importance. Young women have been, at different times, a huge audience for horror-thrillers and this film may have tapped that audience in an unexpected way. It is also possible that the film is playing like a classic horror film and will go flat through the rest of the weekend. I hope this isn’t the case: I think it will rebound with word-of-mouth if that is the case… but I wouldn’t rule it out. But this film has gone from what looked like a nice little hit to a potential cash cow. This will be Paramount’s biggest non-franchise opener since Interstellar. And the sequel is set up in the film. Another film that reads genre but is more than it appears to be is You Were Never Really Here, which will do something around $60k per screen on three this weekend. It is a demanding, tough movie about a man of violence who is on the edge of self-obliteration… for some a non-starter… for me, a masterpiece by Lynne Ramsey, based on the novella by Jonathan Ames, with an Oscar-level performance by Joaquin Phoenix. A24 opens Lean on Pete to over $10k per screen. Entertainment Studios opens Chappaquiddick to a modest $5 million or so, which is about enough to make it to profit, all in. And The Miracle Season goes onto the heap of Christian outreach films that didn’t reach many Christians.